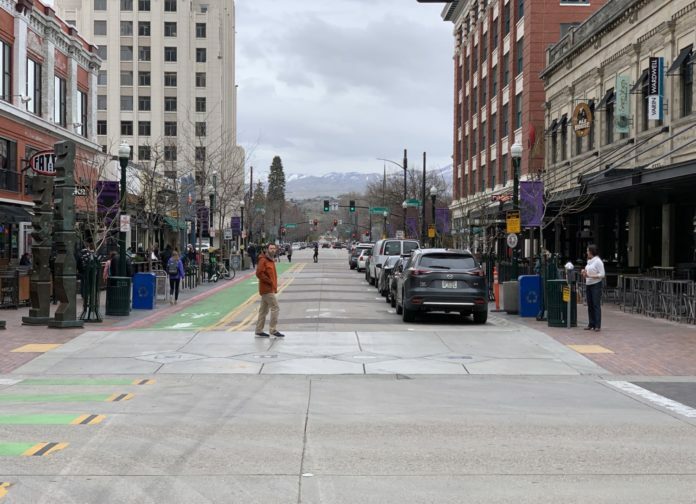 Should the street in front of Boise’s ‘restaurant row’ close? The Downtown Boise Association and a student group at Boise State is out with a survey looking for input on 8th Street between Main St. and Bannock St. The questionaire asks if part or all of the road should be closed to cars. The two blocks are owned by the City of Boise, after the Capital City Development Corp. transferred ownership last year. The survey is part of an urban economics course at Boise State University, and they stress it’s only being studied, for now. The class is working with the Downtown Boise Association and City of Boise. “At this point, this idea is only being studied, there are no planes to make any vehicle access changes,” the survey header reads (in all caps). A closure could “foster a more park-like environment in the heart of downtown…” they wrote. Questions gauge if folks are OK with a temporary or permanent closure, how much of the stretch should be closed, and when. 8th Street features a single north-bound vehicle/bicycle lane along with a contra-flow bike lane going southbound. It is bordered by patios for numerous restaurants, including Dawson Taylor, Ruth’s Chris, Red Feather, Pie Hole and others.